John DeCuir was born June 4, 1918, in San Francisco and he was destined to be an artist. When DeCuir stumbled upon a sign painter who offered him a paintbrush, he was immediately drawn to the artform. Although his father wanted him to be a concert violinist, he started drawing in his head while practicing violin, envisioning the art on the tiled wall. Each afternoon, he’d put his idea to paper. Eventually, he could create an image square by square, starting at the top left corner and drawing down to the bottom right with picture-perfect accuracy. He went on to use his artistic abilities as an art director and production designer in Hollywood. In the course of his career, he designed the productions of classic movies such as Cleopatra, The Bride of Frankenstein, The King and I, and South Pacific. DeCuir earned eleven Oscar nominations and won three for his work on Cleopatra, The King and I, and Hello, Dolly!. At age 6, DeCuir begins to study the violin. After discovering the paintbrush, DeCuir splits his time between mastering the violin and the canvas. He practices the violin each morning, meanwhile drawing pictures in his head to redraw later from memory. DeCuir eventually acquires the ability the draw from one corner to the other like a laser printer. DeCuir is hired as a matte shot illustrator at Universal Studios. DeCuir studies at Chouinard Art Institute under Herb Ryman. As a new employee at Universal, DeCuir would arrive early and brew a pot of coffee. By doing this simple thing, he caught the attention of the company’s producer. He would stop by each morning for coffee and soon enough, he began to take note of John’s work. “A cup of coffee got him his first job. That along with a great deal of talent, but the coffee helped. Summary: Marco Polo travels from Venice to Peking, where he quickly discovers spaghetti and gunpowder and falls in love with the Emperor’s daughter. The Emperor Kublai Khan is a kindly fellow, but his evil aide Ahmed wants to get rid of Kublai Khan so he can be emperor, and to get rid of Marco Polo so he can marry the princess. Ahmed sends Marco Polo to the West to fight barbarians, but he returns just in time to save the day. DeCuir sketched a magnificent bar for the film Destry Rides Again, but was told that the bar simply could not be made on the film’s low, b-movie budget. But when the director saw the bar, he sent the script back to the writers and told them to make a story worthy of this bar and they raised the budget accordingly. DeCuir is promoted to Art Director at Universal Studios. Summary: At overcrowded Westgate Penitentiary, where violence and fear are the norm and the warden has less power than guards and leading prisoners, the least contented prisoner is tough, single-minded Joe Collins. Most of all, Joe hates chief guard Captain Munsey, a petty dictator who glories in absolute power. After one infraction too many, Joe and his cell-mates are put on the dreaded drain pipe detail prompting an escape scheme that has every chance of turning into a bloodbath. Summary: Pepe Le Mako leads a gang of jewel thieves in the Casbah of Algiers, where he has exiled himself to escape imprisonment in his native France. Inez, his girlfriend, is infuriated when Pepe flirts with Gaby, a French visitor, but Pepe tells her to mind her own business. Detective Slimane is trying to lure Pepe out of the Casbah so he can be jailed. Against Slimane’s advice, Police Chief Louvain capture Pepe in a dragnet, but his followers free him. Inez realizes that Pepe has fallen in love with Gaby and intends to follow her to Europe. Slimane knows the same and uses her as the bait to lure Pepe out of the Casbah. Summary: Jackie Walsh, divorced from Vernon Walsh, faints just before her marriage to Herbert Fletcher and learns she is pregnant, and ex-husband Vernon is the father-to-be. To win their legal battle over the custody of the baby-to-be, Vernon decides to marry ex-girlfriend Wanda York. Jackie is regretting the divorce and decides to discourage Wanda by telling her she is going to have triplets. 20th Century Fox hires DeCuir as an Art Director. The first film to be released in widescreen using new CinemaScope anamorphic lenses, The Robe was a breakthrough for the film industry. DeCuir was one of the first to design sets in this new format which was nearly twice as wide as previous films. 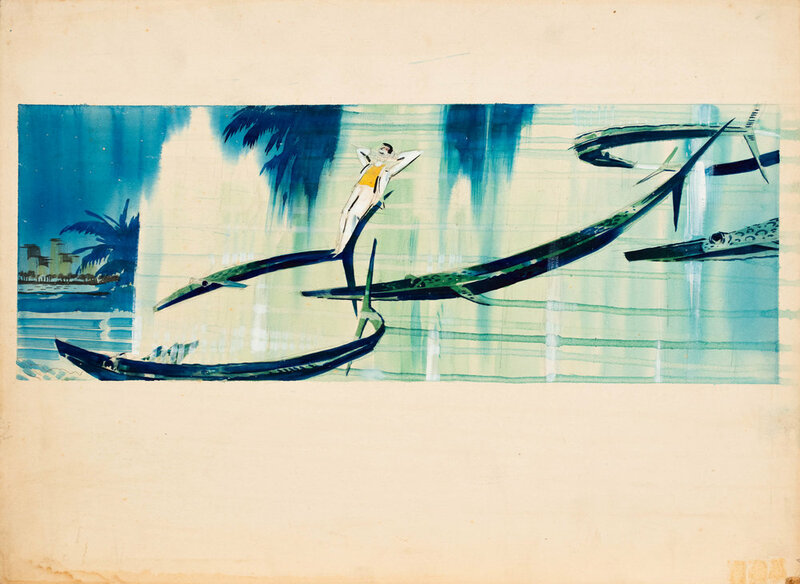 His work transitioning to the new layout was instrumental in future composition and set design. Summary: Boisterous, fun-loving, and popular Washington D.C. hostess Sally Adams is appointed U.S. Ambassador to the Grand Duchy of Lichtenburg, Europe’s smallest country. In Lichtenburg, the Duke and Duchess are negotiating a political marriage for their niece, Princess Maria in exchange for a substantial dowry. However, the country is desperate for funds, and turns to the inexperienced ambassador for a much needed U.S. loan. Sally refuses to talk money, that is, until she meets the ultra charming Gen. Cosmo Constantine. Meanwhile, Sally’s press attaché Kenneth Gibson falls head over heels for Princess Maria. Summary: On a trip to France, millionaire Jervis Pendelton sees an 18 year old girl in an orphanage. Enchanted with her, but mindful of the difference in their ages, he sponsors her to college in New England. She writes him letters, which he doesn’t read. After 3 years, he goes to visit her at a dance, not telling her that he is her benefactor. They fall in love, but the usual movie-type difficulties get in the way before they can get together at the end. 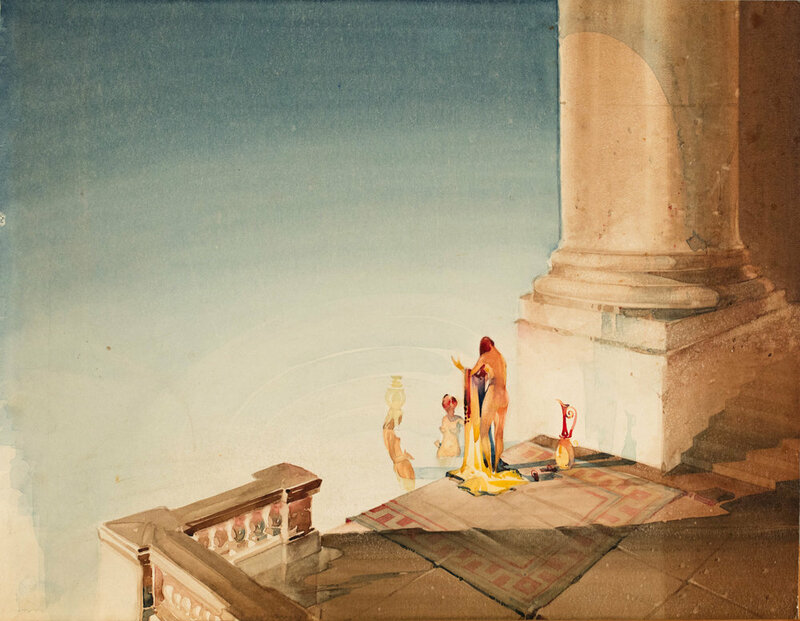 DeCuir’s colorful and breathtaking watercolors in The King and I leave the impression of unexpected romance. The movie is based on the Rodgers and Hammerstein musical, and follows the story of a schoolteacher who travels to Siam to teach the young princes and princesses, and ends up finding love in their King. While filming the ballroom scene for The King and I, director Walter Lang insisted that the cameras continue to back up in order to get more of DeCuir’s enormous set into the shot. He kept backing up until he bumped into the studio wall, but it was still not enough. Soon after, a ten foot hole was carved into the studio wall to allow for the cameras to continue to back up and capture more of the set. Initially, Yul Brynner was opposed to wearing pink in the ballroom scene. He said that he felt too frilly and would not stand for it in the final recording. But after seeing how the set complimented his look so well at the color test, he rose for a standing ovation and praised DeCuir on his ability to make him look so manly. Nominated for 1 Oscar - Best Music Scoring. Summary: Phaedra is a poor sponge diver on the lovely Greek isle of Hydra. While diving, she discovers an ancient brass and gold statue of a boy riding a dolphin, which is said to have the magical power to grant wishes. Her shiftless boyfriend wants to sell it to an unscrupulous art collector, but Phaedra wants to give it to anthropologist Jim Calder, who would return it to the Greek government. During World War II on an island in the South Pacific, love blooms between a nurse and a Frenchman both caught up in the war. 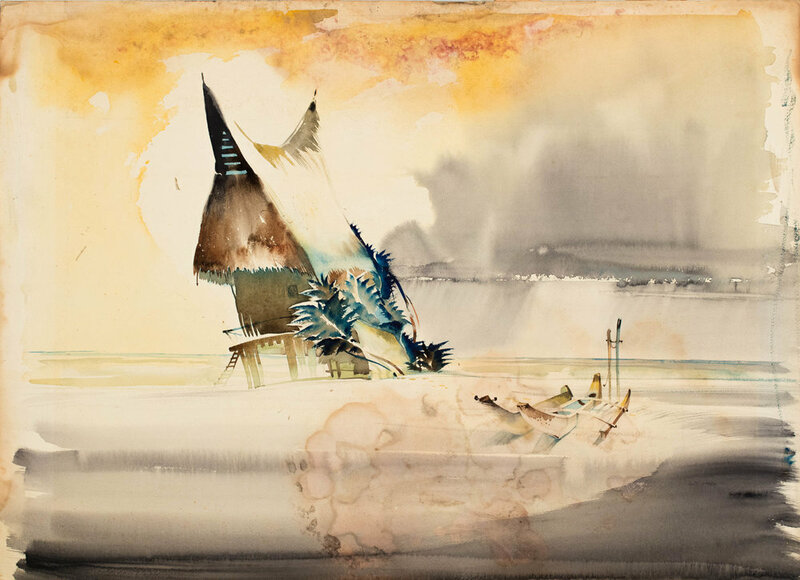 Sketching with charcoal and watercolor, DeCuir uses vibrant colors to design island scenes for the movie South Pacific, based on the Rodgers and Hammerstein musical. While filming the “Bali Ha’I” sequence for South Pacific, director Josh Logan wanted colored lenses that would subtly change the look of the scene. However, the color changes in this scene are more than subtle, and they were the result of a fight. Colorist Leon supplied him with lenses that would do the job, but Logan thought that they were too subtle. After a long disagreement, Logan attempted to create the lenses himself. When Logan and the crew realized that the film was now far too colorful, they tried everything they could to fix the film strips but to no avail. It was too late. DeCuir helps Walter Wagner pitch Cleopatra to the board at 20th Century Fox. This massive project would be a huge investment. 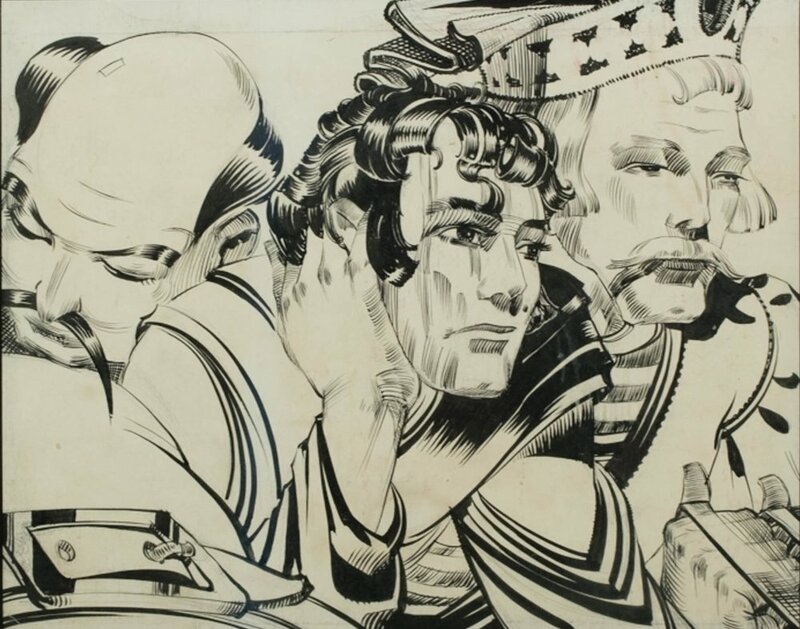 Wagner told DeCuir, “Whenever I have to take a break, you start talking!” DeCuir wowed them with the conceptual artwork and that’s what sold the movie to 20th Century Fox. Nominated for 3 Oscars: Best Art Direction-Set Decoration, Color; Best Cinematography; Best Costume Design. Summary: Exploring the life of Peter, from being a successful fisherman to becoming a follower of Jesus Christ and being dependent on Jesus Christ. DeCuir is promoted to Production Designer at 20th Century Fox. Cleopatra was the one of the biggest productions of the 20th century. With a final budget of $31 million, the production nearly bankrupted the studio. The custom-designed sets by DeCuir inspire awe and create an environment of grandeur for the magnificent story of Egypt’s last queen. Summary: Pope Julius is eager to leave behind works by which he will be remembered. To this end he cajoles Michelangelo into painting the ceiling of the Sistine Chapel. When not on the battlefield uniting Italy, the Pope nags Michelangelo to speed up his painful work on the frescoes. Summary: A man sells his soul to the devil in order to have the woman he loves. DeCuir transitions to freelance production design. Summary: Boxer Jack Jefferson is the world’s reigning heavyweight boxing champion. There’s just one problem, he is also the first black heavyweight champion, and that bothers a lof of people. Jack’s celebration is cut short, as Jack is framed for crossing a state line with Eleanor, his white fiancé, a violation of the Mann Act. Facing a prison sentence, Jack escapes to Europe, with Eleanor in tow, encountering problems in England, and then Franc, and eventually landing in Cuba. In Havana, Jack agrees to enter the boxing ring for what might be the bout of his life. Both Jones and Alexander (the leading actors) were nominated for Oscars. With DeCuir Sr. as Production Designer and DeCuir Jr. as Art Director, this father and son project has inspired designers since its release in 1984. This film is largely admired for the presence and even character of the main building, 55 Central Park West, designed by John DeCuir Sr.
“[Spook Central] played such an important role that in my mind it became a character in the film,” says DeCuir Jr. 55 Central Park West was so important to the story that it was fabricated from many different parts to create a narrative environment that was just right. The lower street and main part of the building were filmed on location in New York, where the real building exists. However, they couldn’t cause a sinkhole and explosion on the streets of Manhattan so they recreated the street on a stage in Los Angeles. 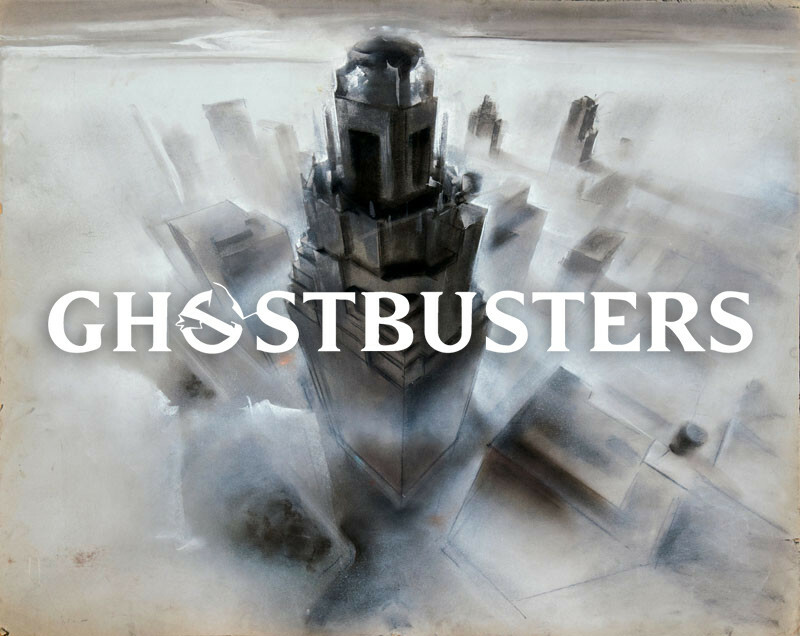 The temple and the upper floors of the building were created with matte paintings, miniatures, and full-size sets for shots throughout the movie. DeCuir Sr. constructed both Dana’s and Louis’ apartments as a single unit at The Burbank Studios in LA. You can learn more about the process of creating Spook Central in the Connectivity lesson in The Pillars of Design.